Tweet, post, like, share or comment on something lately? Chances are, your customers already have – and it may have been with, or about your company. As more people take to social media to communicate and interact with businesses, it’s important to understand the interactions customers have with a company and its social networks. The challenge with most companies is that social data is often managed solely within the confines of marketing, customer support, and social media teams. Why not share social insight with other internal teams that may benefit from it? 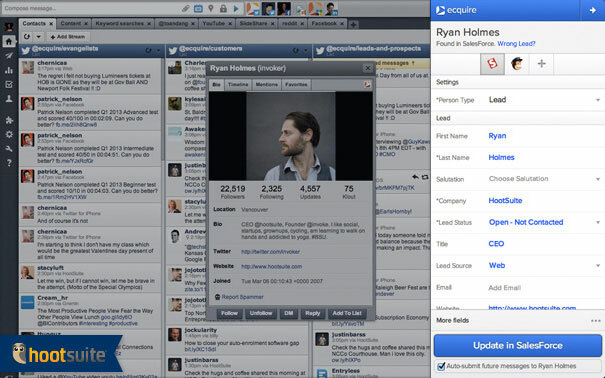 Introducing Ecquire, a Chrome extension that is now integrated into HootSuite. It allows you to capture customers’ social profile information from social networks directly from the HootSuite dashboard, and add it into customer relationship management (CRM) software solutions like Salesforce, Highrise or Stride, as well as MailChimp and Google Docs. Ecquire is a workflow productivity tool that helps businesses capture social data through smart, automatic data entry. Whenever you interact with a customer or prospect on social networks in HootSuite, you can seamlessly add or update their social contact information with the simple click of a button. Select the Ecquire button within a social profile, then it will save the contact information to the right account in your preferred CRM system. Click on Ecquire button within a social profile or message to save the contact in your CRM system. The Ecquire extension connects to your CRM and workflow within minutes. No signup is required, simply install the extension and log into your existing CRM account(s). 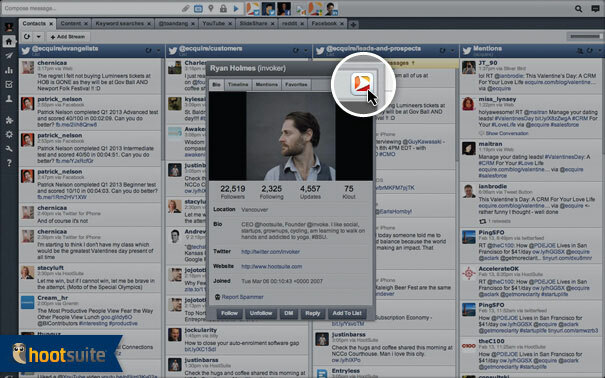 Once installed, you will find the Ecquire button across your favorite social network sites as well as Gmail. Ecquire finds the right accounts for you to easily save contacts in your CRM and share social engagement information with your entire company. Armed with the right information, companies can reach out to more potential customers and have more intelligent conversations with them. In the past year, Ecquire users saved over 2,000 hours in data entry and disjointed workflows, and created more than 100,000 leads and contacts in their CRM. Gain deeper insight on customers by using Ecquire to seamlessly capture social contact information into your CRM. 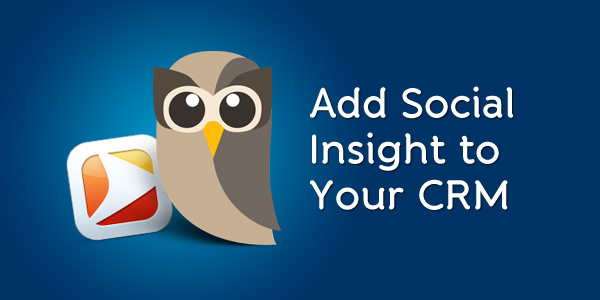 Enable internal collaboration, knowledge sharing and simplified workflows amongst your company with this tool that allows you to seamlessly add social data directly from the HootSuite dashboard into your CRM system. Try Ecquire today and start developing deeper, more meaningful relationships with your customers.